The standard Dachshund is 12 to 14 inches tall (to shoulders) and weighs 16 to 32 pounds. The miniature Dachshund is 8 to 9 inches tall (to shoulders) and weighs 9 to 11 pounds. He has a medium-length coat that is soft and straight, or slightly wavy. His coat color can be black, tan, cream, red, brown, or a combination of colors. Dachshunds come in two sizes: standard and miniature. 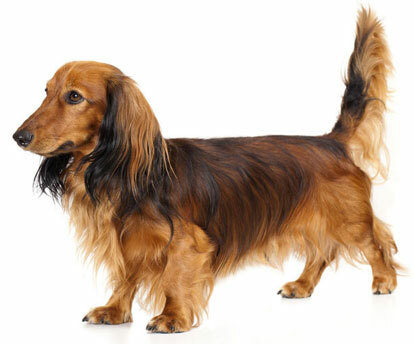 They also come in three coat varieties: smooth, longhaired, and wirehaired.